Trade in another manufacturer's firewall and receive the Firebox T55 with Total Security Suite at a great price. 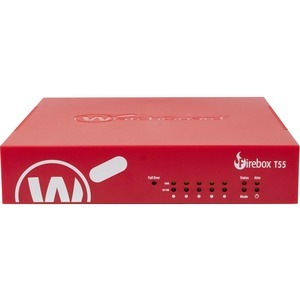 WatchGuard Firebox T55 delivers enterprise-level security at firewall speeds up to 990 Mbps. Firebox T-55 includes five 1-Gigabit Ethernet ports and one PoE+ port to power peripheral devices such as wireless access points or security cameras. Use it as a stand-alone security solution or centrally manage it from corporate headquarters, with RapidDeploy technology to make remote deployment easy. Flexible management tools give administrators access to security capabilities from an intuitive console, scriptable CLI, and web UI. WatchGuard Dimension, which provides deep, real-time visibility into network activity and security events, is included at no additional cost.